In medium bowl, stir together pumpkin, brown sugar, vanilla, cinnamon, nutmeg and cloves. 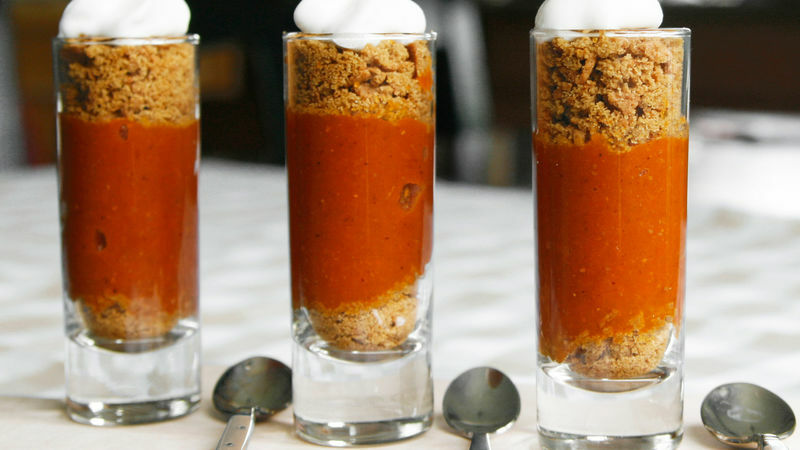 Drop about 1 teaspoon crushed cookies in each of 8 shot glasses. Divide pumpkin mixture evenly among glasses. Top with remaining crushed cookies. Add a dollop of whipped cream to each just before serving. Make sure you use pumpkin, which is distinctly different from pumpkin pie mix. Pumpkin pie mix will not yield the same results. To get pumpkin mixture into shot glasses easily, spoon into small plastic bag. Cut a corner, and pipe it in. Tap shot glasses lightly to remove any bubbles from mixture.